When I started this project, I had no idea how popular this pattern was (McCalls 6796). I just thought it was cute when I saw it on another blog. But fitting this on my body turned out to be a real challenge. I chose a beautiful sweater knit from Gorgeous Fabrics (sold out). In retrospect, this knit may not have been the right choice for me – it added bulk where I didn’t need it. But it’s beautiful! That’s a lot of ease through the waist. In fact, the Vogue Sewing Guide would say that is loose fitting. Anyway, I stitched it together as is to start. I ended up having to take the shoulders up about 1/2 inch to fit me better there. And take the armcysce seam a little deeper (1/8 inch). But when I tried it on, it looked like a rectangle on me and didn’t flatter at all. So, I took it in, way in. Better, but the style still didn’t work for me. In fact, I think I over-fitted just under the bust area. I like it on the dress form, but not on me. I’ll be donating it. As for construction I did three things differently from the instructions. First, I set the sleeves in flat. Second, I cut the collar out on the lengthwise grain instead of the cross grain. I wanted the contrasting effect with the ribbing. Third, I hand-hemmed the sleeves and top, since I tend to get wavy hems. So, what did I learn from this project? That I’m still struggling to fit the upper body, I need to do a better job choosing fabrics that flatter my body, and styles, too. I may try the pattern again in the future with a different style knit – one that drapes. 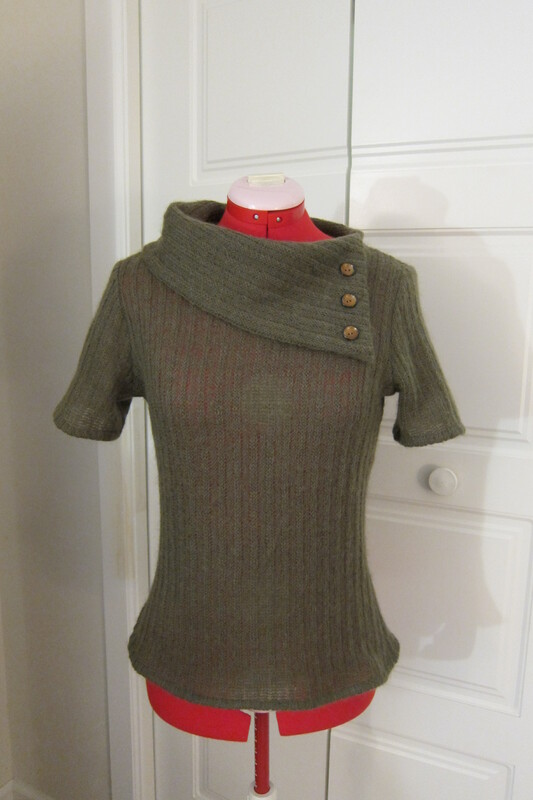 This entry was posted in Contemporary, Tops and tagged fitting, knits, McCalls. Bookmark the permalink. I want to try it again, if I ever come across the right knit. But, for now, I need to finish an old project, and get started on the spring/summer wardrobe.